Systemic inflammation in autoinflammatory diseases can affect nearly all organ systems and hampers patients in their daily life. Ongoing inflammation can lead to irreversible organ damage, such as amyloidosis. Structural assessment of disease activity, damage, quality of life and adherence to therapy is therefore important in the follow-up of these patients. To guide physicians in the monitoring of patients and to unify outcome measures in therapeutic studies, scoring forms for disease activity (AutoInflammatory Disease Activity Index, AIDAI), disease damage (Autoinflammatory Disease Damage Index, ADDI) and patient reported outcomes (Juvenile Autoinflammatory Disease Multidimensional Assessment Report, JAIMAR) have been developed. 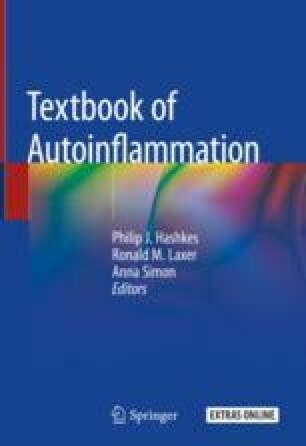 In addition, an international group of experts developed recommendations for the management of autoinflammatory diseases. The aim of this chapter is to provide an overview of the important aspects of monitoring disease activity, to describe potential organ damage and to elaborate on the validated scoring systems, focusing on the four main monogenic diseases; familial Mediterranean fever (FMF), cryopyrin-associated periodic syndrome (CAPS), mevalonate kinase deficiency (MKD) and TNF-receptor associated periodic syndrome (TRAPS).